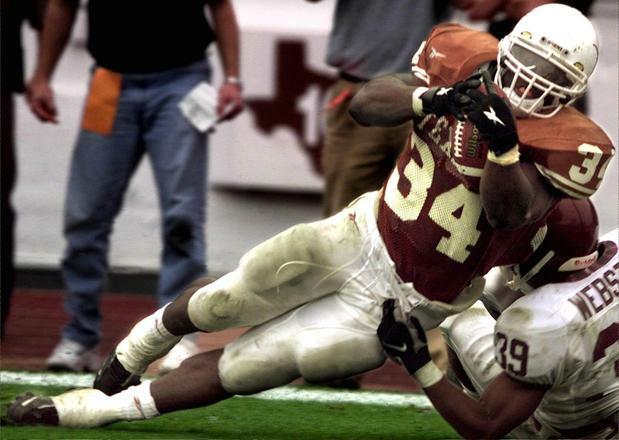 RB Ricky Williams (#34) dove into history as a Texas Longhorn. Ricky Williams was one of the greatest running backs and most decorated player to come out of Texas winning the Heisman Trophy (‘98), Doak Walker Award (’97 & ’98), Jim Brown Trophy (’97 & ’98), Walter Camp (’98), Maxwell Trophy (’98), and the AP College Player of the Year (’98). His accomplishments will forever remain at DKR-Texas Memorial Stadium as the university will erect an 8-foot, 1000-pound bronze statute to memorialize Williams’ success. The statue will be unveiled during a dedication ceremony prior to the Longhorn’s annual spring game on April 1. Williams statue will stand next to Texas’ only other Heisman winner Earl Campbell (’77) which is located at the southwest corner of the stadium.